Ridgeons is a family owned business with its roots firmly planted in the history of the East Anglia Region. Founded in 1911 by Cyril Ridgeon working from his own home in St Barnabas Road in Cambridge Ridgeons has grown steadily ever since to become one of the UK’s largest independent Timber and Builders Merchants. 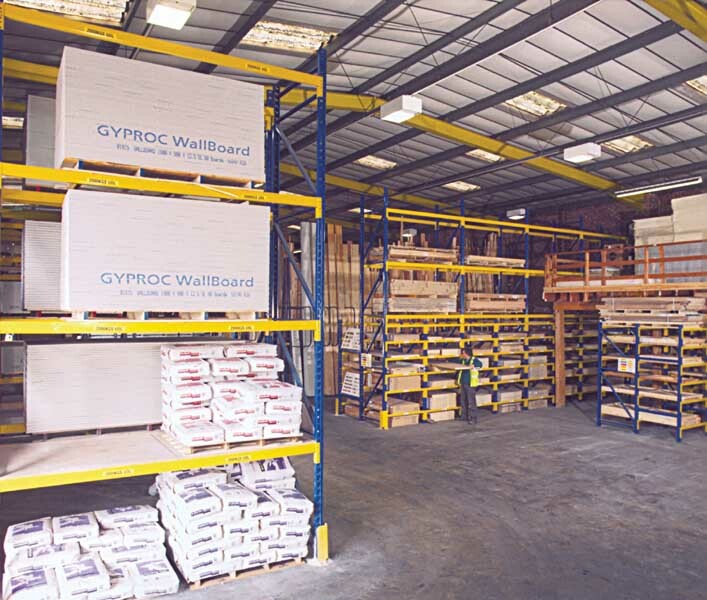 With over 4000 product lines, the Colchester branch, a specialist building materials centre, required a storage system for its timber, plaster board, power tools and ironmongery. 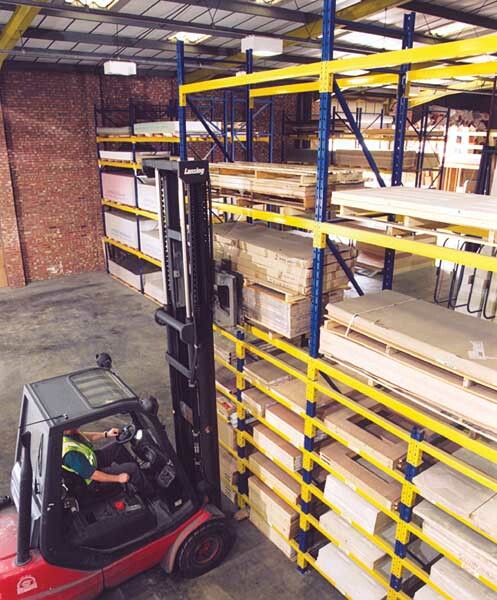 Redirack was chosen to supply and install an adjustable pallet racking system. Given the diversity of the products being stored and their sizes the racking system featured a number of unusual features. 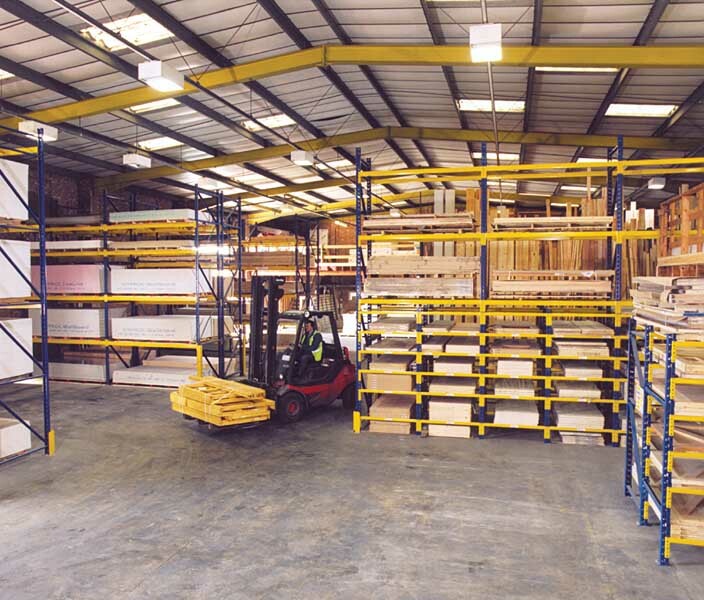 Firstly there are three different racking layouts within the depot. All are built around standard frames but vary in height beam spacing and storage type. There are three double runs of racking that rise to just over five metres, have two bays each and four beam levels per bay. These are used to store plaster board on pallets. 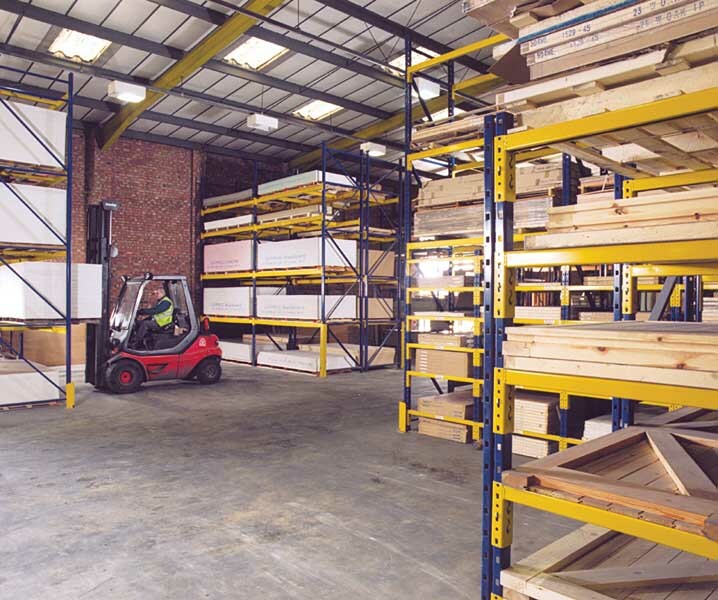 A larger block of racking that has four bays and runs to nearly nine metres in length, features a novel arrangement utilising intermediate frames within the bottom half of the bays. Doors are stored flat and running into the racking, so intermediate frames are used to produce storage locations that support the doors over their whole length. The frames also act as location dividers to keep the doors apart. With the beams spaced at 375mm intervals, this arrangement produces twelve storage locations per bay. The bays above the door storage system are used to store palletised products in a conventional manner. The door storage racking is replicated at a third location within the warehouse. This block of racking is located under a mezzanine floor so only rises to 2.4 metres, but still provides another twenty four storage locations. Corner protectors are used throughout the system to protect vulnerable uprights, and the racking is finished in a smart blue and yellow colour. To aid flexibility some of the bays are decked, so odd sized pallets can be stored.